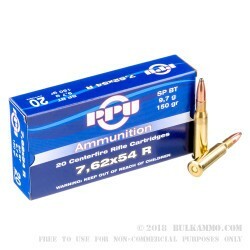 This 7.62x54r ammo by Prvi Partizan is great for thinning out your local deer population, plinking, or target practice. The historic 7.62x54r caliber was developed by Russia in the 1890's, and it is still utilized by various military organizations around the world. Prvi Partizan crafted this 7.62x54r for the shooter looking for a powerful hunting and training cartridge. Each cartridge is snuggly fitted with a 150gr soft point boat tail (SPBT) projectile that is equal parts expansion and accuracy. The boat tail helps the bullet sail aerodynamically through the air and resist wind drift. The soft point mushrooms on impact, taking out muscle, soft tissue, and vital organs as it travels through the body. 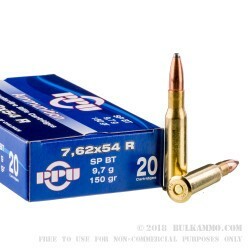 Unlike most military-surplus 7.62x54r ammo, these Serbian-made rounds are Boxer-primed, brass cased, and reloadable. 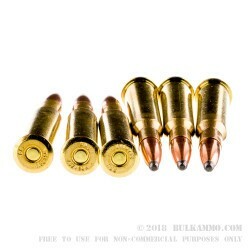 This isn't the cheapest ammo out there, but the spent brass can be reused and reloaded. 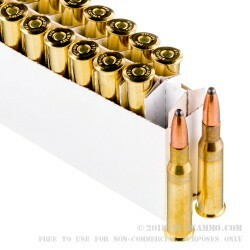 You buy the loaded ammo and get brass that can be reused, which makes it worth purchasing. Performance wise, I've found this to be some very good ammo. I've found that it cycles properly with no issues. It also tends to be a bit more accurate than the surplus rounds that I've been using frequently. Q: Are these steel-core? I bought a load of Tula, which are not marked steel core but stuck to a magnet when they arrived. My local range won't let me shoot it there. Looking for something all-lead for under $1/round. A: Hello Christopher, This Prvi Partizan ammunition is manufactured with a lead core, copper jacketed projectile with a lead soft point. They do not contain any steel and will have no issues passing a magnet test. A: Hello Matthew! I appreciate you reaching out to us about that! This ammunition is loaded with all new components and is not corrosive.